Conveniently located just one block (3 minute walk) from the beach in the heart of Kitty Hawk, Jo’s Bungalow boasts picturesque views of the Atlantic Ocean and easy access to a wide array of restaurants and amenities on the Outer Banks. Start your morning enjoying a cup of coffee on the ocean-view, upper-level sundeck, where you can catch a cool ocean breeze while you bask in the summer sunshine. Then, grab your boogie board and beach bag, and head to the recently widened expanse of shoreline that is situated just a short walk away at the Balchen Street beach access. Rinse off the sand and cool off in the outdoor shower before kicking back on the covered mid-level deck to relax after a long day in the sun. You’ll find ample seating on both decks so everyone in your party can spend quality time enjoying the salty sea air together while you listen to the waves crashing on the nearby shore. With two spacious bedrooms decorated in bright, beachy decor, this cute Kitty Hawk cottage is perfect for couples or a small family. Several upgrades were introduced for the 2017 season, including the addition of a laundry area with a washer and dryer, new bedding and living room furniture, a gas grill and Keurig coffee maker. And if you’re planning to bring your four-legged friend on your next Outer Banks vacation, you’re in luck! Jo’s Bungalow is a dog-friendly vacation rental home that welcomes your furry family member. Located on a quiet residential street, this well-appointed beach house offers plenty of places to safely take your dog for a stroll without the worry of frequent traffic or busy side streets. 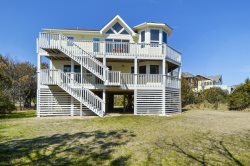 While Jo’s Bungalow has a fully stocked kitchen where you can whip up your own meals in the comfort of your home, the quaint cottage is also situated close to several top-notch Outer Banks restaurants if you’d rather venture out for some fresh local fare. Bad Bean Baja Grill is less than half a mile away, and Arts Place—a locals’ favorite that features live music and the best burgers on the Outer Banks—is just a five-minute drive down the street. Ocean views, easy access to the beach, a prime location in Kitty Hawk and the chance to bring your furry friend on vacation—what more could you ask for? Book your stay at Jo’s Bungalow today!